I first learned about contemplative prayer from Christian radio shows, particularly, the dangers of contemplative practices such as centering prayer. Mind you, Christian radio shows told me that lots of things were dangerous and wrong, such as Catholics, liberals, and Harry Potter. Contemplative prayer borrows from Eastern Religion. Contemplative prayer empties the mind and leaves it vulnerable to demonic influences. Ten years after hearing these warnings, I finally practiced contemplative prayer and found both assessments to be inaccurate. 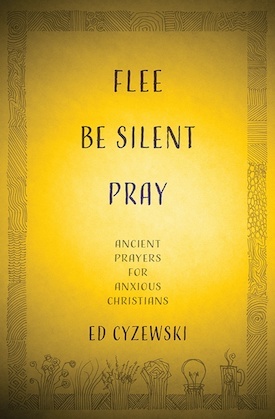 My book Flee, Be Silent, Pray shares my journey out of anxious evangelicalism and the many barriers to this ancient Christian prayer practice. I still consider myself an evangelical today, at least in its historic sense, but I have come to rely on this interior prayer tradition that relies on God’s indwelling Spirit as the bedrock of my spirituality. Far from emptying one’s mind in a pointless manner, contemplation aims to remove distracting thoughts in order to adore God and to surrender to God’s presence. Some have said that the “prayer” of contemplation is God’s work in us. Arriving at a point where I was willing to try contemplative prayer required a season of spiritual despair and a major rethinking of Christian spiritual practices. It wasn’t easy to overcome my fears of contemplative prayer and the significant misinformation available, and I wanted to offer a few explanations for evangelicals who may be fearful of contemplative prayer or uncertain about the benefits of this spiritual practice. I don’t blame church leaders for passing along anxious evangelicalism, and it’s hard to get too angry at the radio personalities who misrepresented it. They all lacked mentors and models to guide them in contemplative prayer. I became more open to contemplative prayer after a pastor from my seminary introduced me to several contemplative practices. If I had access to contemplative prayer training like I had access to Bible study training, I would have certainly embraced it and benefitted from it sooner. It remains challenging to find spiritual directors for many seeking to practice contemplative prayer. While contemplative prayer has a robust presence outside of Catholicism in the Orthodox and Anglican/Episcopal traditions, many of the leading contemplative authors are Catholics. Thomas Merton, Richard Rohr, and Thomas Keating are all Catholics who are widely read and sought-after, and Keating’s Contemplative Outreach network has made significant strides in spreading contemplative practices such as centering prayer. Evangelicals who are already jumpy or wary about Catholics will have a hard time trusting what they say about contemplative prayer. In some cases, evangelicals may treat Catholicism as a completely different religion altogether. When I compare a visit to a cathedral vs. a suburban megachurch, I suppose I can see where they’re coming from. While I remain a committed evangelical, Catholic writers have provided some of the most constructive spiritual direction in my life. Despite all of the misinformation about contemplative prayer, the truth is that the Christian contemplative tradition dates back well into the 300’s, making it as old or older than the final New Testament canon. The practitioners of contemplative prayer also saw their practices as deeply dependent on scripture. The tax collector’s prayer, “Lord, have mercy on me, a sinner,” formed the foundation of prayer used by many contemplatives in the desert who meditated on this prayer while going about their work. Contemplative prayer, which is entered into through a practice such as centering prayer, uses a simple word to teach the mind and body to be still before God. Just as Jesus told his followers to enter a private room to pray, centering prayer helps practitioners enter the secret place of prayer. The authors of contemplative prayer books are generally hesitant to describe what goes on during contemplative prayer. It’s a private, intimate moment of communion with God. Most importantly, descriptions of this type of prayer tend to fall short because it isn’t an intellectual or analytical practice. That may be an instant turn off for evangelicals, but it’s also an essential point of caution about dismissing contemplative prayer. Can you dismiss something as dangerous based on the hearsay of people who aren’t even engaged in practicing it in the first place? Christian leaders have attacked contemplatives on and off for centuries, banning their books and threatening contemplatives with prison, exile, or death. The more concentrated church power became, the more it opposed contemplation. This type of prayer is beyond the scope of leadership’s control because it is interior and personal, even if it is cultivated and supported in community or through spiritual direction. Throughout church history the mystical expressions have either come under attack or been conveniently forgotten in place of the easier controlled dogmas and doctrines. I can tell when I have missed time practicing contemplative prayer, but I can’t exactly tell you what the “results” of contemplative prayer are. They are difficult to quantify, such as a greater awareness of myself and of God. These aren’t the typical measuring sticks that evangelicals are used to in their talks about spiritual growth and holiness. It’s true that those who practice contemplative prayer will enjoy a greater awareness of God’s love and will, therefore turn away from sin. In fact, this growth in holiness is an essential aspect of contemplative prayer, but it defies the simple formulas that evangelicals use in testimonies. Since contemplative prayer relies on God’s indwelling Spirit to guide us into prayer, the transforming that happens is also a fully miraculous work of God’s Spirit that we cannot define on our own. It’s true that contemplative prayer relies on the indwelling Spirit and has roots in scripture, but practices, such as centering prayer, are passed down through traditions, not chapter and verse. That not only means many evangelicals lack access to contemplative teachings, but they are naturally suspicious of them. While there are many Bible experts saying that contemplative prayer is dangerous, there have been few mentors in evangelical circles who can counter that narrative. In addition, contemplative prayer isn’t the kind of spiritual practice you can sample or test to get quantifiable results of any kind. Rather, contemplative prayer is a long-term practice where it’s impact will be gradually noticed over time. It may take a while to reach that point as well! My early days of contemplative practice were agonizing as I confronted all of my negative thoughts and learned how to practice silence before God. It ran counter to everything I’d learned about prayer as an evangelical. In contemplative prayer I had to let go of control, completely surrendering to God’s loving presence rather than pleading with a supposedly disinterested deity. I didn’t have incredible spiritual experiences, and the actual “rest” or peace with God didn’t come until I had a better grasp of how to approach silence before God. I felt the void of not having a spiritual mentor at the beginning who could guide me into this spiritual practice. Websites such as Contemplative Outreach became a lifeline over the years, as well as other spirituality apps that guided me into the practice of daily silence and surrender before God. ← Jesus Is King, America Is in Chaos, Now What? Contemplative prayer actually bring some closer to The Lord as one contemplates His leading through the Holy Spirit. Alas, man’s fear plays right into the opposite. Thanks. I have been practicing a form of this discipline for over 9 years. The results of these Spirit guided musings/meditations/prayers for the 1st 7 years have been consolidated and published as Voices Together, vol. 1 & 2, and The Love Story. The latter focuses on Ps 119. Two years ago, the Spirit led me to begin an examination of the Scriptural basis for the verb, “to believe”. It has been and will continue to be an extremely profitable journey. Thanks John! I am so grateful to see all of the ways the Spirit has guided us toward resting in God through these practices and their variations. “While there are many Bible experts saying that contemplative prayer is dangerous,…”. I would disagree that these contemplative prayer naysayers are definitely NOT Bible experts. They clearly lack even a rudimentary understanding of the historical context the scriptures grew from. Thank you for pointing out this centuries long bias bass in nothing but irrational fear.